It’s been a while since we saw Olivier’s parents — 5 months to be exact. And they were so excited to catch up and meet us here in Vietnam. We started our adventure with them in Ho Chi Minh, and made our way up to Dalat to check out some of the french architecture and beautiful scenery. 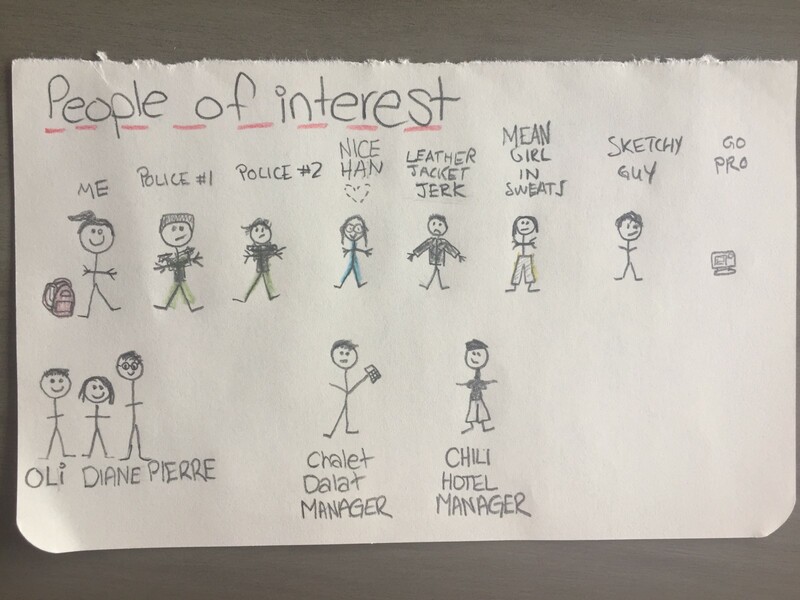 Now before I continue, I’ll share the people of interest with you to better follow the story I’m about to tell…. Hand drawn by Olivier and I. We finished a full day of sight seeing at a hotel / landmark called “The Crazy House”. It’s a huge maze like building that you can walk around and enjoy various themed hotel rooms, open spaces and walkways. I vlogged using my GoPro a bunch of clips of Diane, Pierre, Oli and I exploring the house and then put my GoPro in the top pocket of our backpack as we headed off to dinner. 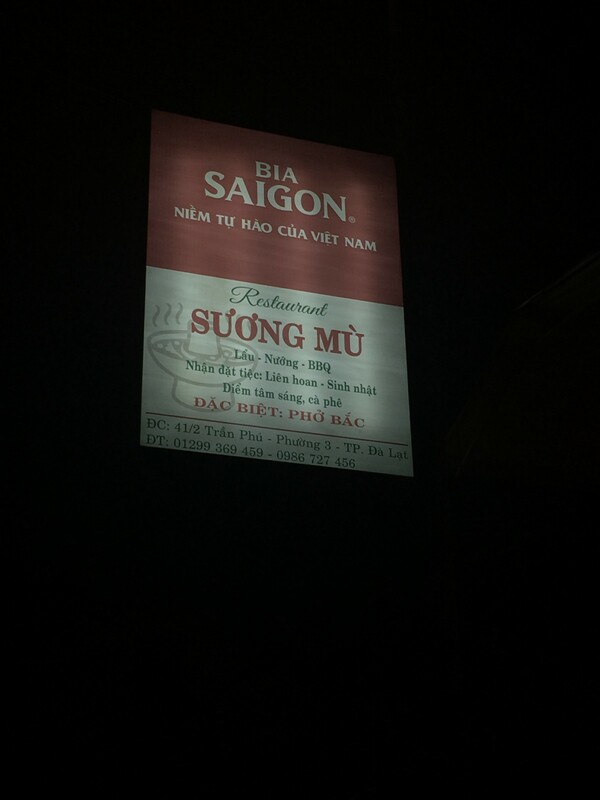 ← Suong Mu that had mention of pho in its sign. So we stopped there to grab something to eat. The restaurant downstairs was filled with a Chinese tour group, so MGIS takes us upstairs to a table. We are the only ones on the top floor of the restaurant. We try to order pho, but the menu was not in english and MGIS did not speak any english. So we do our thing and try to sign language / point and order something on the menu that suggests it may be a type of soup. The meal came and it was not pho, but a small appetizer bowl of good meat and cheese soup. We ate and decided it was worth trying a another restaurant for a second serving of dinner. As we walked downstairs, we realized we were the only ones left in the restaurant as the tour group had left. We paid our bill and then went on our way. Walking back up the alley way, we stopped at a more welcoming restaurant called Chalet Dalat where the wait staff spoke a little bit of english. We ordered some food and I asked Oli if I could grab the backpack from him to get my camera out. …..he looked at me and his face said it all…. We had forgotten our backpack at the previous restaurant. Oli jumped out of his seat, ran down the street and headed straight back to the Suong Mu restaurant. Distance from one restaurant to the other — tops 2 minutes. Oli was gone for 10–15 minutes. Pierre got up and went to check on him just as second dinner arrived and started to get cold. Another 5 minutes seemed to pass when Pierre is running back to our table to say “Maeghan — we think the GoPro is missing”. Pierre runs back. Diane and I sit waiting for them… no longer even remotely hungry for the delicious look food that was infront of us. Oli and Pierre both come back and say I must have lost it somewhere else — they [ENTER CHARACTERS] Leather Jacket Jerk, MGIS and Sketchy guy all say they do not have the GoPro. Knowing 100% it was in the bag before we ate dinner, I decide to march back. Pierre and Diane wait with the food, and Oli and I try again. An added layer of difficulty was the language barrier. We tried to communicate with Leather Jacket Jerk and MGIS using google translate, typing on our phones and passing back and forth. They continued to get more and more frustrated — almost exaggerate saying they did not have the GoPro. My last message to them was a plea for help — begging that if they did take it to do the right thing and return all my personal memories — we had not done a backup in a while. We went back to the Great Restaurant — Chalet Dalat and I went through the whole backpack. Turns out… we were missing Oli’s RayBan sun glasses as well (both items were in the top pocket of the backpack). 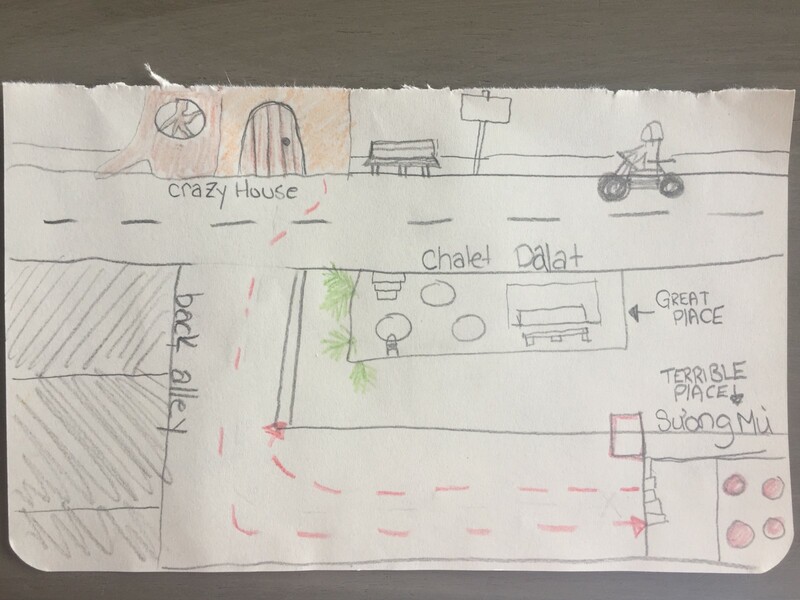 So frustrated by their lies, I went to our waiter at the Chalet Dalat who spoke some english and pleaded with her to help call the police. [ENTER CHARACTER] Nice Han was so wonderful and offered to assist. She asked the manager of the restaurant to help call the police and he had a friend that was in the forces. 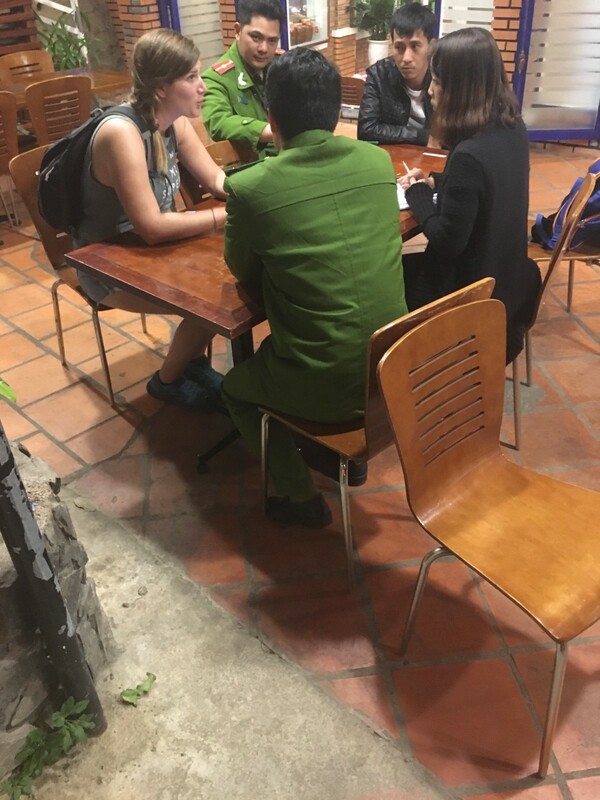 They agreed that Nice Han would come with us to the restaurant to try and negotiate / translate and the police friend would meet us there to fill out a report. Nice Han translated between Leather Jacket Jerk and MGIS to try and understand the situation. They continued to insist they did not have it, even when we offered to pay them to get the items back. Shortly after we made that offer, Police #1 arrived on his motorbike. We re-explained the situation again — confirming there was no way anyone else stole the camera. The only time it was left alone was the 5 minutes we had forgotten it was at the restaurant. Police #1 feels he needs backup and calls Police #2 to join the scene. We continue to discuss the matter, saying Sketchy Guy was no longer on site the third time we returned to the restaurant and that there was no way the item was lost on the street as it was last scene right before we ate our first dinner. Police #2 says they are not able to fill out a police report because we cannot prove who stole the camera (what?!). So this was a sad and closed case. Fighting back tears of exhaustion — I give up on the GoPro and just ask for our insurance purposes to get a piece of paper acknowledging that we did try to work with police on the matter to find the camera. But they were very unwilling to do so — saying they couldn’t confirm on paper that the GoPro and sunglasses were stolen — again, because we could not prove the camera was stolen. Finally, Nice Han was able to convince the police to draft a piece of paper we can take to insurance to hopefully get some money for the stolen item. They spent 45 min talking back and forth to what can go in the letter, and what could not. 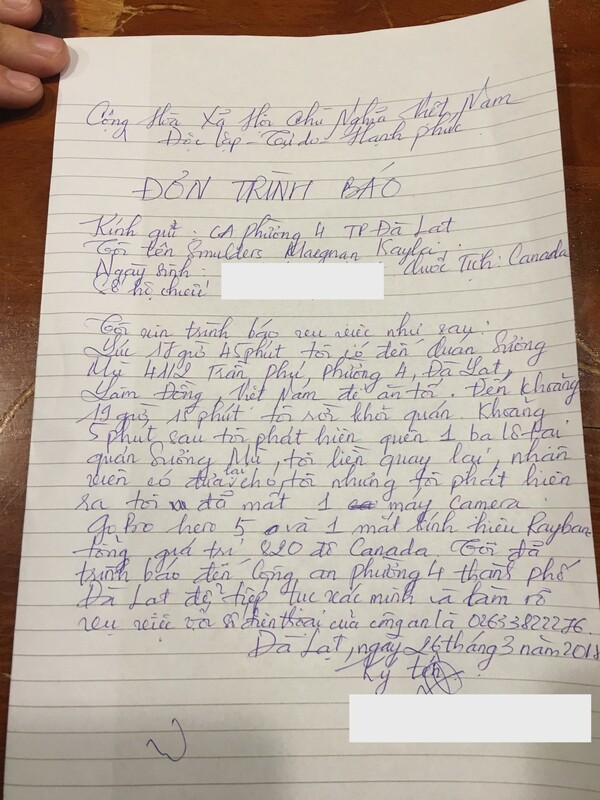 We ended the discussion with this hand written note that the police then decided to keep. I was able to take a picture of it… but beyond that had no documentation, support or way to prove that the camera was stolen. We left and headed back to our hotel. It was sad…. all of us were exhausted and had not planned to be out so late in the evening (so not properly dressed for the drop in temperature). We gave Nice Han a hug to thank her for her kindness and she responded with “good luck will find you during your trip” and wished us a good night. By the time we got back we were all a bit emotional from the day — silly, not necessarily about the stolen device, but the fact that we looked these people straight in the eye and knew they were lying. Not sleeping much, we received a knock on our door at 8am. Completely shocked, we jumped out of bed and ran downstairs. The owner of our hotel [ENTER CHARACTER] Chili Hotel Manager, said his brother was a policeman and it was unacceptable to have tourists experience Vietnam in this way. Apparently, because we went to the police and fought to have a letter, the police threatened to shut down the restaurant. And you know what… the three waiters magically found both the Sunglasses and GoPro! The Hotel manager arranged to have the waiters come to Chili’s and hand over the items in return for us to remove our hand written police notice to keep their restaurant in business. MGIS showed up on a scooter, didn’t even look at us and spoke to the Chili Hotel Manager. I didn’t argue — I was so struck by the luck that had come that morning. But if you look back to the beginning of this story… I mentioned we left the restaurant AFTER the tour group had gone.... and we were the only ones left in the restaurant with the waiting staff. And the two people who went up and found our bag, opened it… grabbed the items… then placed them in the grass or tree somewhere (as there was grass all over them when they returned them to us). MGIS ended by saying she would talk to the police and give them the proper story of what happened and that the items being returned. What a perfect storm… right?! If we had given up after the first try, or not called the police, or had the support of Nice Han to write the letter… they would have probably gotten away with it. I called Nice Han and Chalet Dalat to thank them so much for their help and together we celebrated a moment of joy. But hey! We’re on a beach, I got my GoPro with all the footage still on it and am able to now laugh at a crazy adventure we experienced together. I can’t thank Pierre, Oli and Diane for sticking it out with me and for the random act of kindness we received to solve this case. To think in the last 5 months… this is the only unfortunate event that has happened.